As there are less than three weeks to go until Howard Days begins, we're beginning a series of posts to give you as much information as possible to enhance your attendance or even to entice you into coming! There is a total information package over at www.rehupa.com (click the REH DAYS 2014 tab) that gives you pretty much everything you'll need to know in one shot. We'll be doing a more condensed version of that here but still give you the facts about The Best Two Days in Howard Fandom. A brief history will tell you that the first Howard Days was actually a day: June 13, 1986 found ten intrepid visitors converging on Cross Plains for an event organized by Rusty Burke and some of the fine folks of the town. The wise people of Cross Plains then realized that they "had" something here - their town was home to a man who created a literary sub-genre and a world-known fictional character - and people wanted to come see where he lived and worked. 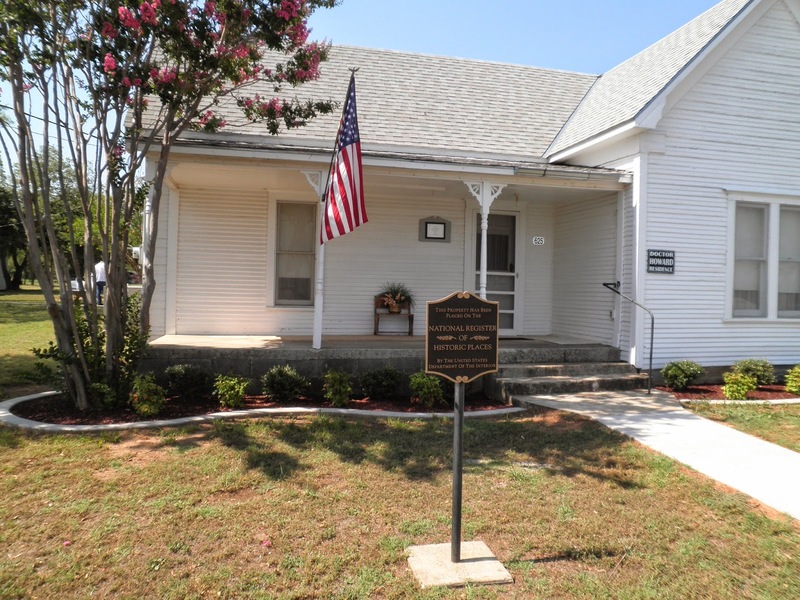 When the house in which Bob Howard lived became available, the civic organization Project Pride of Cross Plains was formed to buy the house. Without making it sound overly easy, Project Pride not only fixed up the ramshackle structure but then turned it into the Robert E. Howard Museum. Their foresight has insured that the Legacy of Robert E. Howard will continue on. Ok, down to brass tacks: ROBERT E. HOWARD DAYS is a two-day festival honoring the memory and legacy of Ol' Two-Gun Bob Howard, a true Texan and American original. 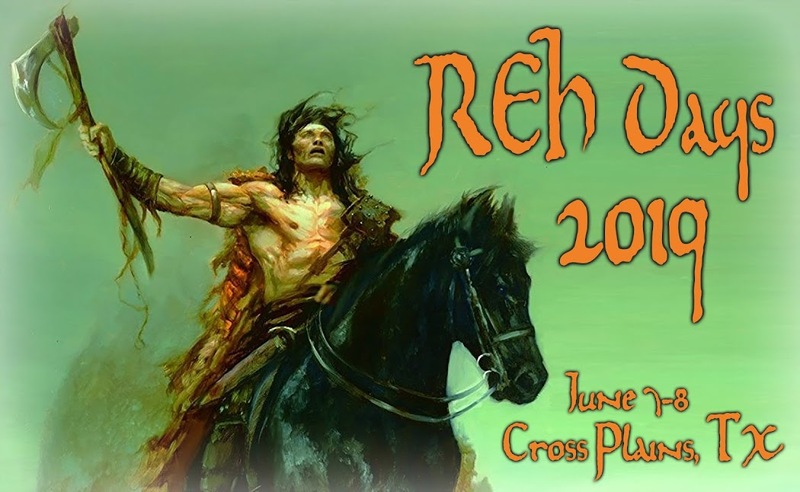 It takes place every second weekend in June in at the Robert E. Howard Museum on Highway 36 in Cross Plains, Texas; this year it will happen Friday and Saturday, June 13th & 14th. Howard Days includes these (and more) events: the Howard House & Museum is open both days from 9 to 4; you may tour the house and the surrounding grounds and enjoy a cool drink in the Pavilion next to the house, view a large selection of Howard items in both the Gift Shop and at the REH Swap Meet, attend panels at the Cross Plains Library where you can view original REH manuscripts, get a special postal cancellation souvenir, take a bus tour around town, have a cook-out lunch, enjoy a celebration Banquet and Silent Auction, have some genuine Texas BBQ at a genuine Texas ranch - and best of all, enjoy the fellowship and friendliness of Robert E. Howard fans and the people of Cross Plains. There is a small fee ONLY for your dinner at the Friday night Banquet. Every other event and activity is FREE of charge. There's not a better deal around for your vacation dollar! If you are still on the fence about coming down, please know that you don't need to officially register - but if you do decide, the registration fee applies only to your dinner at the Banquet. The folks of Project Pride like to also use this registration as a measuring stick, but you do not have to register to attend any of the activities. If you would like to register, send $15.00 per person to Project Pride REH Registration, POB 534, Cross Plains, TX 76443 or via Pay Pal: ProjPride@yahoo.com. Seating is limited at the Banquet so please register as early as you can (by June 6th). Like I was saying, this is the first in a series of more specific posts about Howard Days. We'll be continuing with our Featured Attendees posts as well. We certainly hope to see you at Howard Days this year. It really IS the Best Two Days in Howard Fandom!